Re-keying locks is the process of changing the combination of a key cuts inside the lock cylinder. When a customer ask our locksmith to change the key, he means to re-key the lock. In this case, our locksmith will take the old key in order to open the cylinder. We’ll provide you with a fresh new key and match new pins inside the cylinder. Re-keying locks means that we don’t need to change the lock. Re-keying locks service is usually cheaper than replacing all the locks on your property. With this in mind, you’ll be able to use your same locks again after changing the key. Re-keying locks is necessary when you move to a new home, whether renting apartment or purchasing a new house. It’s recommended by the police to re-key your locks 72 hours after moving to a new home or commercial business. As you never know who has the old key for your property, you never be sure that you’re safe and secured. Re-keying locks can be done fast and easy by our locksmiths. As a professional locksmith team, we are mobile and available any where in Allentown Pennsylvania. Whether you own a commercial property such as office or grocery store, we can help. And whether you move to a new apartment or a single home, we can help, too. It’s important to mention also that we can install a master key system on commercial properties. A master key system is quite different from a simple lock re-key process. When a locksmith install a master key system in your locks, that means 2 keys with different cuts can operate the locks, at the same time. Sometimes, big corporations with many departments and employees, prefer to install master key system, so an authorized person in one department won’t be able to get into another. A good example of a business with master key system installed is Amazon. Amazon warehouse in Breinigsville PA is full with employees and merchandise shared by departments. Every employee in the warehouse of Amazon can enter only to his department, but no to other departments. Re-keying locks done by our locksmith specialists in Allentown is the best way to go with your key change project. We drive to your location in our full equipped mobile locksmith shop to get the job done on the spot. In all cases, we will be able to provide you with a new key to your locks. 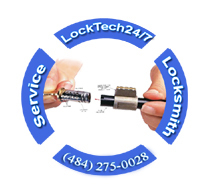 The benefits of calling us to get your locks re-keyed are simple, lower price and professionalism. As a 24/7 emergency locksmith in Allentown, we can arrive after 20 minutes of your first call, so also if you suspect of burglary or have fired one of your staff, we can arrive as soon when you need us. When you need a residential locksmith to re-key the locks of your house, or a commercial locksmith to re-key the locks of a business, we’re a good choice to call for estimate. It may be true that other locksmiths won’t give you a quote over the phone, but we definitely can do. As the process of re-keying locks is vary from lock to lock, many locksmiths are charging different prices. We have an average price for re-keying locks, so you have no surprises. Re-keying your locks done by a local Allentown Locksmith gives you the opportunity that you need to focus on your day. We are only one phone call away, please call now.